My new favorite deal is the Lello 1375 Ariete Cafe Prestige Coffee Espresso Maker. Most of the Espresso Makers that are quality are 1000$ or more (Gaggia Carezza is best), but the best one in a reasonable price range seems to be this Lello 1375 Ariete Cafe Coffeemaker. What we find is a lot of people grabbing this Cafe Prestige Coffee Maker by Lello and spending some of the money saved on a quality burr grinder to get more efficiency out of your coffee beans. The Lello has a frothing mechanism that leaves espresso makers with a wonderful crema on the top each time when finished. You simply turn the espresso machine on and wait for it to warm up (for 950 watts, it warms up fast). It also helps to have your cup at the top heated up, so before using you may wish to run the machine with just water and no coffee grounds to heat it up. You can dump this water from the portafilter into the espresso cup and then fill the portafilter back up with grounds and then you can make your espresso! Cleaning the portafilter is easy, just by running hot water through it and then let it dry. It is hard to believe an Espresso Maker with a pump like the Lello 1375 Ariete Coffee Maker can be less than several hundred dollars. Amazon provides FREE SHIPPING with the Lello 1375 Ariete as well. With a quality burr grinder you can get the best out of your freshly ground coffee, as if you were using a 1000-2000$ dollar machine at your local coffee shop. 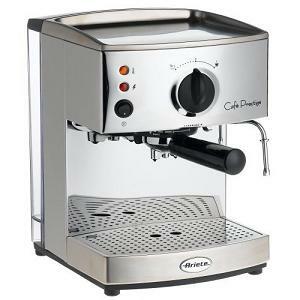 Edit – Since being added to the site a few years back, the Lello Ariete Coffeemaker has been one of the most popular items on kitchenproductdeals.com, with many choosing to purchase this quality espresso machine at a bargain price. Thanks to everyone who have been emailing with comments about the Lello. I am looking for a manual for the Lello 1375 Ariete Cafe Coffeemaker. If any one can email me a copy I would greatly appreciate it.